Hosting a business function or social event in Goldsboro, NC? 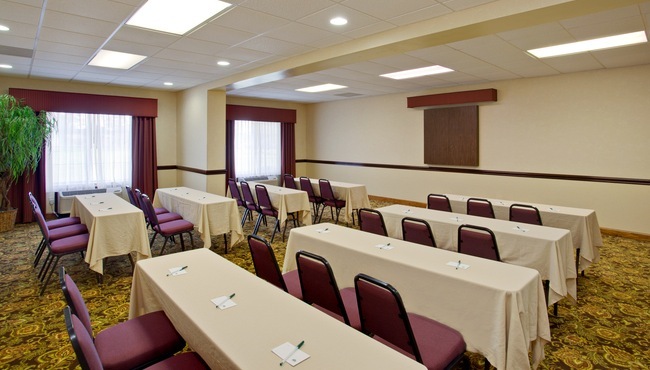 The Country Inn & Suites offers 850 square feet of meeting space that can accommodate up to 40 guests and comes equipped with many convenient amenities. Engage your attendees with a presentation using our free high-speed Internet access, audiovisual equipment and six-foot projection screen. Our friendly staff is also delighted to recommend catering and assist with planning. Sports coaches and tour group leaders can take advantage of our room block options and use our meeting room for special events.